This is a charming eight unit complex with a layout that facilitates interaction, and room for a good-sized common house. We hope to gradually convert it to cohousing as units turn over. I live in one unit and another long-time community member is moving into another in 2019. 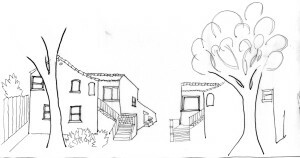 One of the long-term residents is interested in participating in cohousing, and three units will be available for new community members soon — hopefully around March 2019. The remaining two households are living their lives, and are welcome stay here for as long as they like. That will initially make us a community of six households. The community can grow in the future, either when there is more turnover in the complex, or when cohousers move into adjoining properties.